Steven Allan Spielberg (born December 18, 1946) is an American film director, screenwriter and producer. 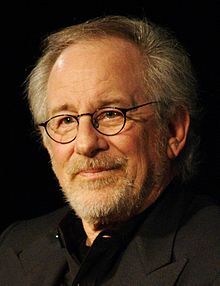 A three-time Academy Award winner, Spielberg is also the most financially successful motion picture director of all time. There is no such thing as science fiction, there is only science eventuality. Failure is inevitable. Success is elusive. I love Rambo but I think it's potentially a very dangerous movie. It changes history in a frightening way. Oh, torture. Torture. My pubic hairs went gray. The most expensive habit in the world is celluloid, not heroin, and I need a fix every few years. Godzilla was the most masterful of all dinosaur movies because it made you believe it was really happening. I interviewed survivors, I went to Poland, saw the cities and spent time with the people and spoke to the Jews who had come back to Poland after the war and talked about why they had come back. People have forgotten how to tell a story. Watching violence in movies or TV programs stimulates the spectators to imitate what they see much more than if seen live or on TV news. In movies, violence is filmed with perfect illumination, spectacular scenery, and in slow motion, making it even romantic. However, in the news, the public has a much better perception of how horrible violence can be, and it is used with objectives that do not exist in the movies. In an interview by the Brazilian magazine Veja (1993). Spielberg adds that so far he has not permitted his young son to watch some of his well-known movies (Jaws, the Indiana Jones series) because of the amount of blood and violence shown. I think there's a side of me that's trying to compete with Lucas and Spielberg — I don't usually admit this publicly — because I tend to think that they only go so far, and their view of the world is rather simplistic. What I want to do is take whatever cinema is considered normal or successful at a particular time and play around with it — to use it as a way of luring audiences in. Steven's films are marked most importantly by a faith in our common humanity. His stories have shaped America's story, and his values have shaped our world. I hate Spielberg and I think he has done a brutal damage to cinema. David Trueba, Fotogramas (July 2008).